Sometimes I run into a photograph where it is not so much the tree itself that is so awesome but the way the photographer uses the tree to create a spectacular image. Such is the case with the photo below, taken from NASA’s wonderful site, Astronomy Picture of the Day. Explanation: If you climbed this magnificent tree, it looks like you could reach out and touch the North Celestial Pole at the center of all the star trail arcs. The well-composed image was recorded over a period of nearly 2 hours as a series of 30 second long, consecutive exposures on the night of October 5. 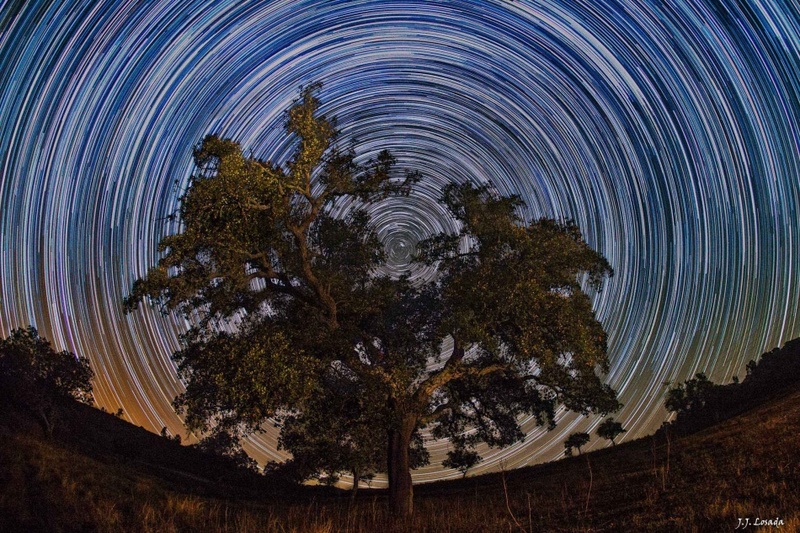 The exposures were made with a digital camera fixed to a tripod near Almaden de la Plata, province of Seville, in southern Spain, planet Earth. Of course, the graceful star trails reflect the Earth’s daily rotation around its axis. By extension, the axis of rotation leads to the center of the concentric arcs in the night sky. Convenient for northern hemisphere night sky photographers and celestial navigators alike, the bright star Polaris is very close to the North Celestial Pole and so makes the short bright trail in the central gap between the leafy branches.